Senior Jillian Greene running the 800. Greene placed second in the 800 meter dash today in an extremely close finish. 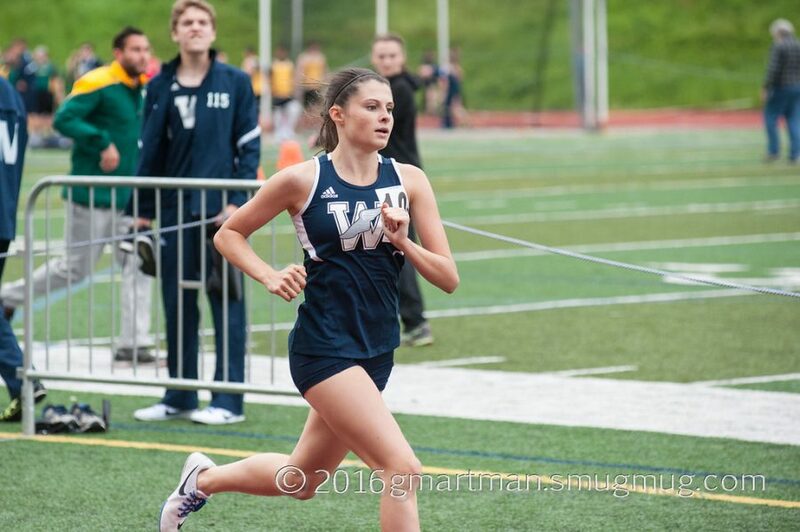 On Saturday morning, track athletes from Wilsonville had an early morning wake up call – an hour long bus ride departing from the high school at 7:45 AM. The destination? Battle Ground High School in Washington, just a short drive over the border, for the Tiger Invite. This was the first invitational meet for the Wildcats this season, and it was a good indicator of what’s to come in the next couple months. Out of 24 schools, the Wildcat girls placed 8th in overall team scores, and the boys came in at 15th. Due to the nature of the meet, only the top two athletes in each event attended, with a few athletes snagging a third spot in an event due to an impressive qualifying mark or time that placed them well within the top percentage of those competing this weekend. Additionally, the JV 3000 meter races were open, so Wilsonville sent plenty of distance runners to compete on both the girls and boys sides. Senior Gabe Pernisco recorded a PR in the 200-meter dash with a time of 24.84 seconds. On the girl’s side, senior Jillian Greene took second in the 800 by 0.45 seconds, and ended with a new personal best of 2:19.99. Junior Sam Prusse ran an impressive 800 as well, and placed fourth with a season-best 2:22.74. In the boys 800 meters, senior Trevor Johnson earned 6th out of 46 athletes, running a season record 2:04.86. In the same race, freshman Ben McClelland placed 10th with a PR of 2:07.74. Wilsonville put on an impressive show in the boys JV 3000 meters, and nine out of the ten boys running secured a new personal best time. Sophomore Andrew Worth had the best finish for the Wildcats, placing fourth in one of the largest events of the day. The ‘Cats did well in field events too. In the boys shot put, senior Mike Church threw a 45-0.975, which was a new PR and far enough to earn him fourth place. Freshman Aiden Siler secured a new four-inch personal best in the high jump with a jump of 5’2”. In the long jump, freshman Andrew Pernisco placed third out of 57 competitors. Andrew shined in the triple jump as well, jumping a PR of 39’9” and ending up 7th. On the girl’s side, senior Kellie Yoshida finished 6th in the triple jump with a mark of 31’3”. Delaney Dougherty, a senior, placed third in a large field of girls javelin throwers, with a throw of 105’2”. Another senior, Lauren LaFreniere, threw a personal best 88’3” in the discus. LaFreniere had an outstanding day and got a new PR in the shot put as well, throwing 34’11.5” on her way to third place. It was a long day, with some events starting as early as 10:00 AM and others not beginning until 6:20, but overall, the Wildcats had a successful meet. Being so early on in the season, the amount of PR’s achieved today is a good sign of the potential this team has.